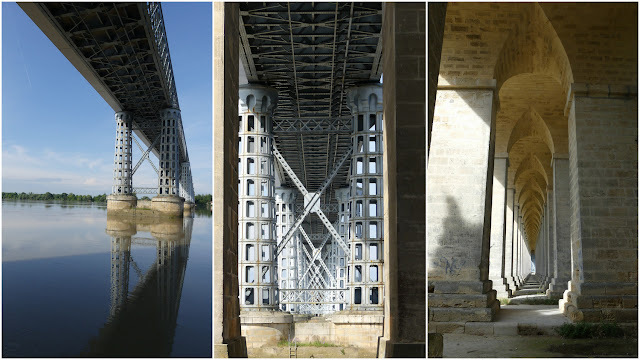 We have travelled some 20 kilometres to the north-east of Bordeaux to view one of the most spectacular bridges in the area: the iron wonder that is Pont de Cubzac, which spans the width of the Dordogne river between Saint-Vincent-de-Paul and Cubzac-les-Ponts. 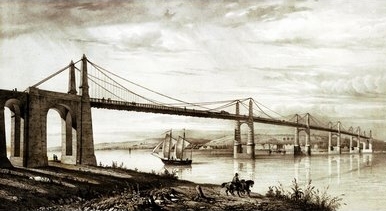 In some ways, this is the third incarnation of the bridge, whose history goes all the way back to 1836 and the completion of a grand and ambitiously-proportioned suspension bridge, the deck of which was supported by cables that stretched over six pairs of 26-metre-tall pylons. However, in March 1869, a violent storm seriously damaged one of the columns and parts of the deck began tilting precariously. Fearing the bridge would collapse, authorities chose to move fast and the bridge was demolished in full, although it was decided to retain the sturdy viaducts connecting the bridge with dry land on either bank of the river. The way things were, source: Wikipedia. The original suspension bridge design as featured on structurae.info. Between 1879 and 1883, the second generation truss bridge was built, to the designs of renowned engineer Gustave Eiffel (whose other achievements in the area include a now-disused railway bridge in Bordeaux, and Sainte-Cécile observatory tower in Arcachon), in conjunction with chief engineer Émile Nouguier. Eiffel opted for a distinctive cantilever system of horizontal metal beams, carrying eight decks supported by nine sets of columns, making for a total span measuring 553 metres (1,545 metres when incorporating the connecting viaducts). Over the ensuing years, the bridge was not only a fixture on the landscape but a precious means of crossing the river; Pont de Cubzac’s strategic geographical significance eventually resulted in its partial destruction by the Germans during the Second World War. But once the War was over, the bridge was soon rebuilt and the third incarnation was complete in 1947. 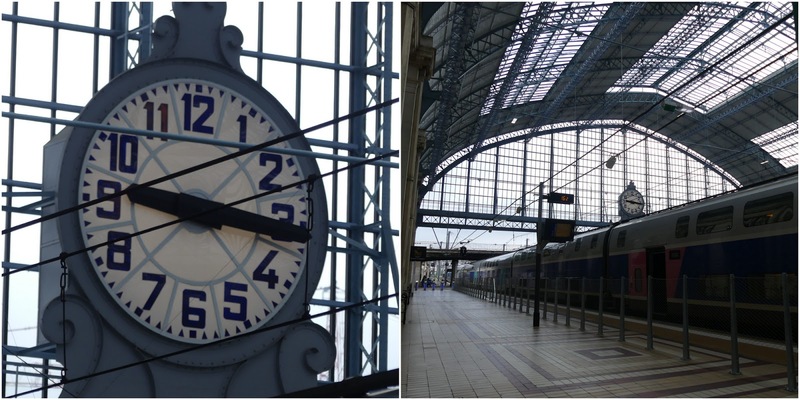 Symbolically, it was the work of Gustave Eiffel’s grandson, Jacques Eiffel. The bridge as it looks today, viewed from Cubzac-les-Ponts. Note the A10 motorway and LGV railway bridges in the distance. Throughout the second half of the 20th century, the narrow bridge formed the backdrop to many a memorable traffic jam, particularly during summer months when it had to funnel dense holidaymaker traffic on the busy Route Nationale 10. Things finally improved when the A10 motorway bridge opened in 1974, providing an easier and faster means of crossing the river. Various sections of the bridge. Finally, throughout 2016 and 2017, as part of an extensive renovation campaign, the bridge was widened through the addition of a deck for pedestrians and bikes along the southern flank. This eagerly-anticipated enhancement has been unanimously saluted by walkers and cyclists, as well as by drivers behind the wheels of their cars, who no longer have to skirt around bikes or shave past pedestrians on the narrow pavements which were previously in use. To get a feel of the inner workings of the bridge, I arranged to meet Mike Foster, arguably the most famous Australian in Gironde and the founder of the excellent Bordeaux Expats website. 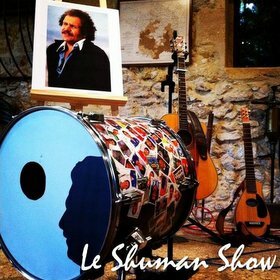 Mike, who works as a freelance digital communications specialist, lives with his family in nearby Saint-André-de-Cubzac. We meet up on the waterfront in Cubzac, which Mike explains is an ideal location for picnics and quality family downtime. Under the bridge downtown, I could not get enough (courtesy Red Hot Chili Peppers). Together we venture under the bridge to admire the tall, cathedral-like underbelly of the 19th-century viaduct section which, as well as featuring some very old graffiti carved into the stonework, is surely one of the most photogenic spots in the whole of Gironde! Under the bridge downtown, I gave my life away (courtesy Red Hot Chili Peppers). We then edge our way along to some poorly-maintained steps up to road level and onto the bridge proper, and view its impressive array of commemorative historical plaques. Bizarrely, at the point where the iron structure begins, the coat of arms of the city of Paris sits proudly in between inscriptions marking the 1946-1948 reconstruction. Mike and I are a little surprised by this sight of an emblem which is some 522 kilometres out of position. Mike Foster, who performs his own stunts, inspecting just some of the many commemorative plaques and the Parisian coat of arms. We make our way across the bridge along the new footway, observing from afar the virtual twin iron railway bridge that lies a few hundred metres downstream, which was completed just after the original Eiffel crossing in 1886. Looking the other way we can see the busy A10 motorway bridge and the new LGV high-speed train railway bridge. Four generations of bridges across the Dordogne are within eyeshot, and the name of Cubzac-les-Ponts seems more relevant than ever! We pass a new information panel summarizing the history of the bridge and view large red circles and a green triangle to guide boats navigating on the Dordogne. Finishing up on the Saint-Vincent-de-Paul side of the bridge, we admire another plaque, this time commemorating the ceremonial inauguration of the renovated bridge in April 2018. We then look back through the bridge. 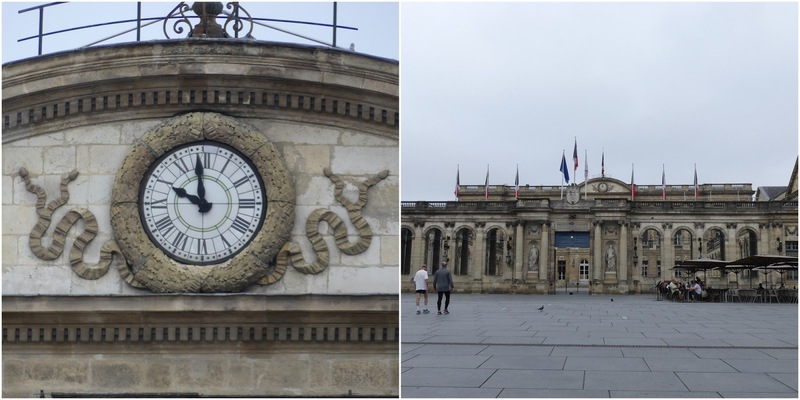 Here, though, the first arch is topped off by the dates 1879 and 1883, in line with the original Eiffel construction, positioned either side of the crest of Bordeaux! "Lilia sola regunt lunam unda castra leonem"... or "the lilies alone reign over the moon, the waves, the fortress and the lion". See this previous Invisible Bordeaux article about the city's coat of arms for the full story! Mike and I note the new benches that have been installed to enable people to take time out to sit and enjoy the view, and during our time there we see cyclists, laid-back ramblers and serious Nordic walkers darting past, complete with go-faster batons. My Australian travelling companion then points out the original pavements, which strike me as being strangely inhospitable and a touch hair-raising compared with the genteel delights of the new walkway. Heading back to our starting point in Cubzac-les-Ponts we trade observations about how pleasant the bridge has now become, cross-referencing with the surprising and contrasting decision to remove the cycle paths from Bordeaux’s Pont François-Mitterrand to make way for an extra car lane, thus forcing cyclists who previously commuted daily across the bridge to make a seven or eight-kilometre detour either way to complete their trips. 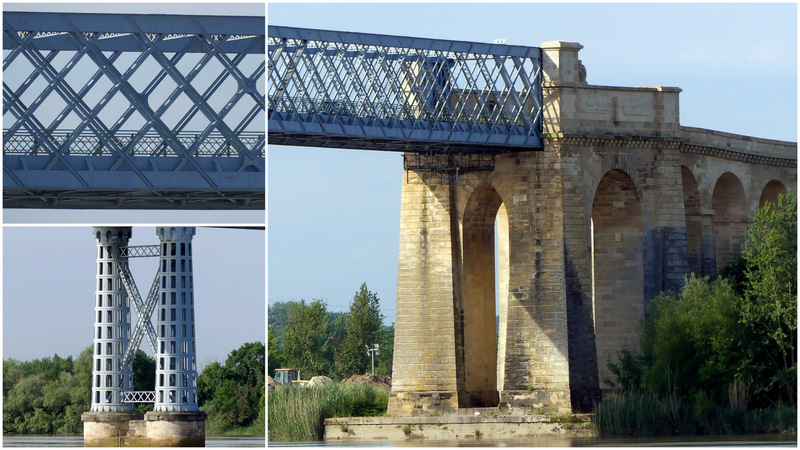 But, over on Pont de Cubzac, the right balance does appear to have been struck, and this impressive iron child of the 19th century is most definitely battle-ready for 21st-century usages! 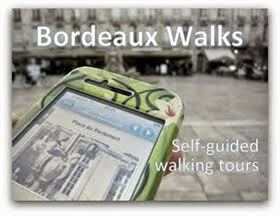 > Locate it on the Invisible Bordeaux map: Pont de Cubzac, Cubzac-les-Ponts. > Big thanks to Mike Foster for the meet-up and the insider's tour! 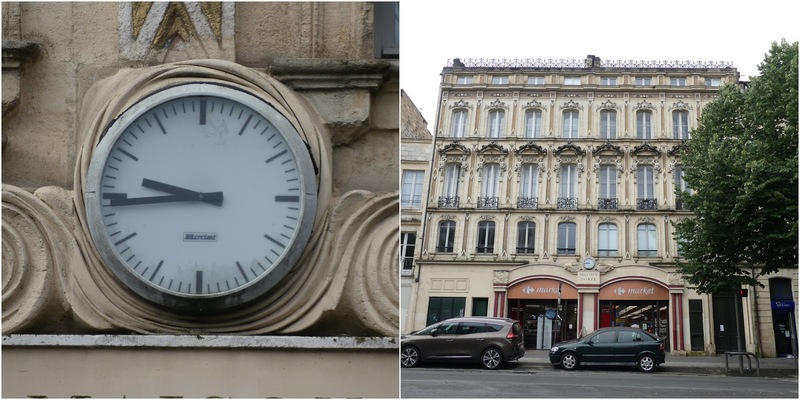 You may have just finished exploring the first set of clocks compiled by Invisible Bordeaux. 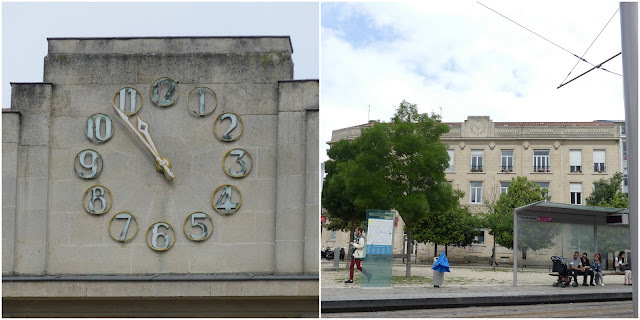 But still there are more, starting with this lovely timepiece to be seen at Barrière Saint-Genès. 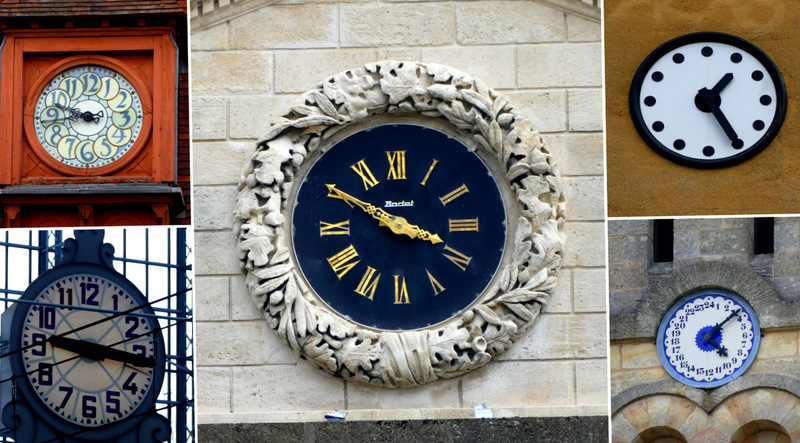 This clock gave its name to the café that it presides over: Café de l'Horloge. 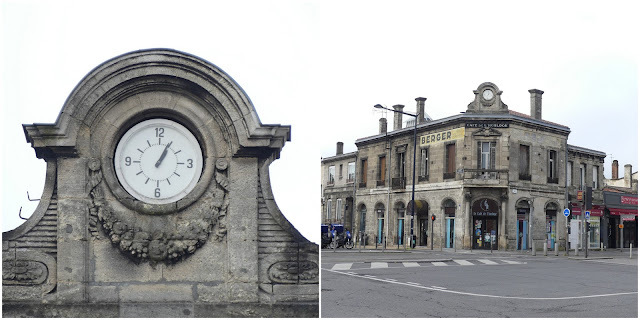 The main façade of Saint-Jean station comprises three identical clocks. Thankfully, they are all reassuringly on time. Inside the station proper, two magnificent clocks watch over proceedings at all times. In the station concourse, this pragmatic, minimalist Bodet clock enables travellers to time things down to the very last second. Another Bodet clock can be seen on Cours Victor-Hugo above the entrance to a Carrefour Market on a building still known to many as la Maison Dorée. 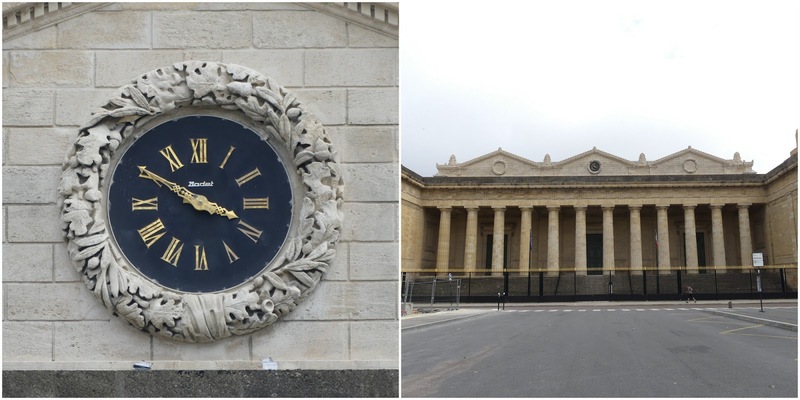 A Bodet design has also been embedded into the exterior of the Palais de Justice on Place de la République. This clock is currently out of order. This classic clock is to be seen outside Palais Rohan, the city hall. 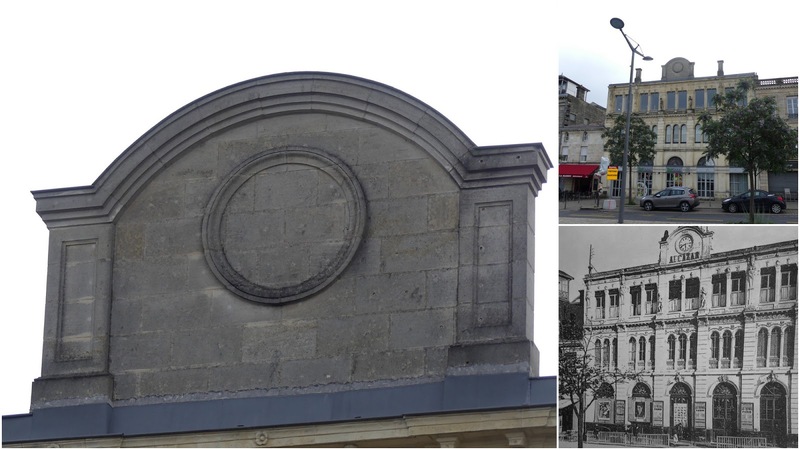 This more minimalist affair can be seen atop the Caisse d'Épargne building on Place Paul-Doumer. 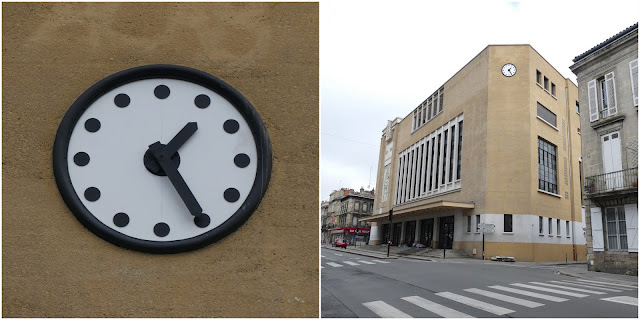 Taking minimalism one step further is this clock on the corner of the Bourse du Travail building on Cours Aristide-Briand. The clock is currently frozen in time. 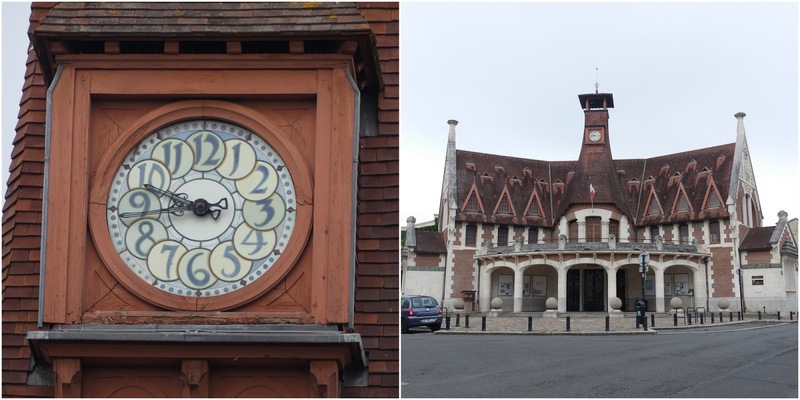 Also currently out of order is this clock on the municipal library building opposite Capucins food market. 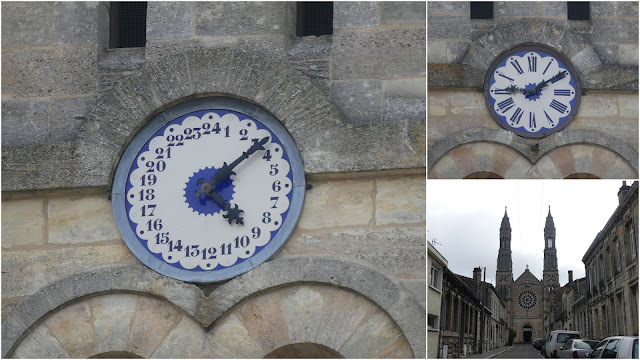 Another clock which has stopped is on Sainte-Eulalie church. Crazy building, crazy clock. There was never going to be anything conventional about the timepiece on the Bastide quarter's Maison Cantonale! 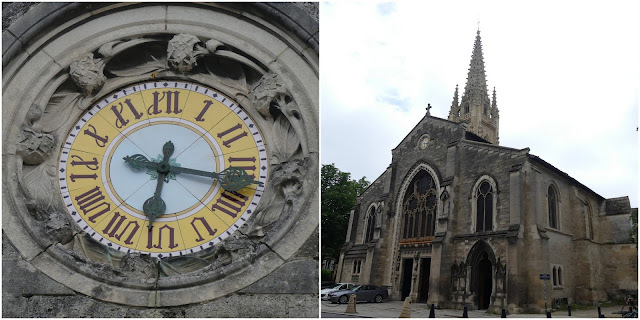 Sacré-Cœur church's steeples feature not one but two clocks. The 24-hour dial on the left was designed so that railway workers living in the vicinity instantly knew whether it was AM or PM. 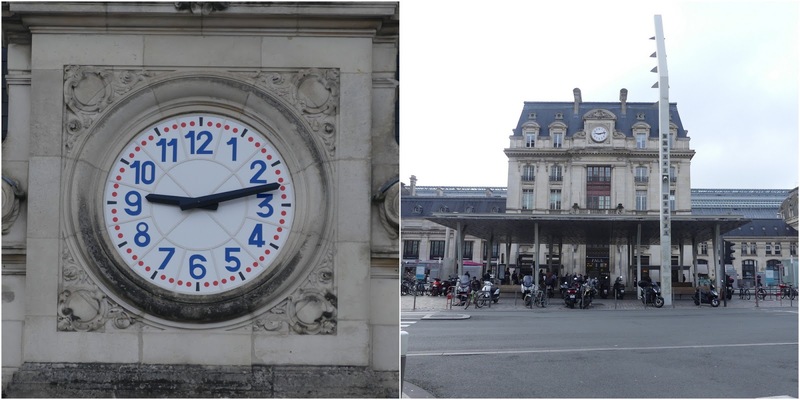 The 24-hour clock, which has already been featured on the blog, is functioning perfectly: it was 09:10 when I was there. And we'll finish up on Place Stalingrad and a clock that got away, but which is clearly visible bottom right, which shows the Alcazar music hall theatre in the early 1900s. Time's up! 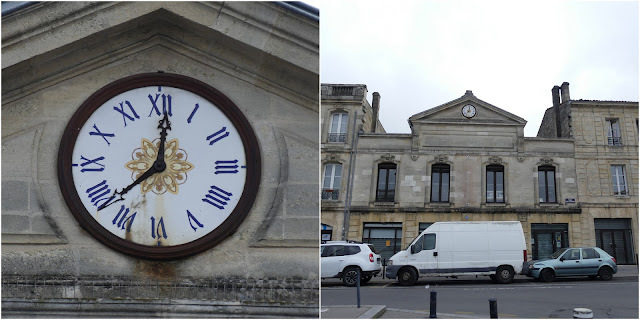 Along with chapter 1, there is a third selection of Bordeaux clocks available by clicking here! 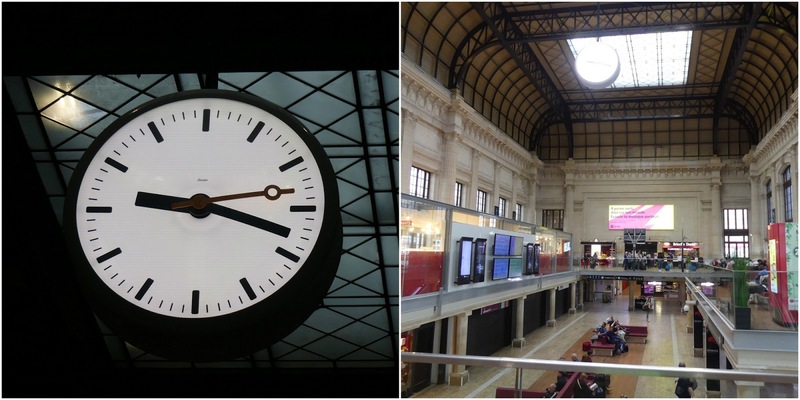 All of those lovely clocks have also been stuck back-to-back in this short motion picture. Sit back and enjoy!